Last year I wrote an article on OAM and ADF Applications with Anonymous access. This week I did some work with another A-Team guy building on that previous work. The new requirement was that the customer wanted two different portions of the app to be protected by different login pages. In other words a user would start on an unprotected page and then choose to go to "A" or "B". If you click on "A" you see one login page and then (after logging in) you see page A. If you click on B you see a different login page and then page B. If I was doing this with plain old HTML or JSPs I would probably just put A's resources in directory /a/ and B's resources in /b/ and we'd be done. But as you know from the previous post things can get a little bit more complex when you are using ADF. Martin is going to blog more deeply about the ADF side of the story (link to follow) and I'm blogging about the OAM setup side. Martin's post is now available on the A-Team's WebCenter blog. What's more when you click on a button or a link the URL doesn't necessarily update the way you expect. Or put more simply, all of that stuff you think about when protecting simple JSPs or other web apps may not apply when you're talking about ADF and WebCenter-based apps. 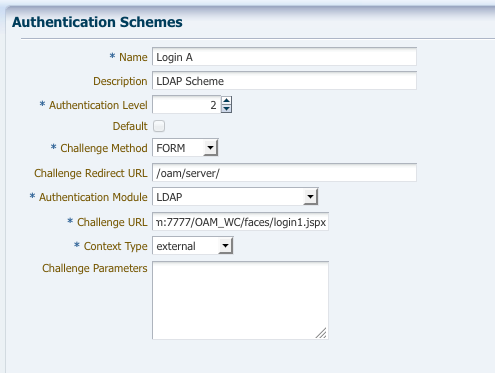 From my previous post you'll probably recall that the simple way to protect only one part of an ADF app is to protect /adfAuthentication with OAM and then rely on ADF security to secure the app. Which works perfectly if you want one login page for the entire app. In this case the customer wants a single application to have multiple login pages depending on where the user is trying to go. Now normally I'd say "that's silly. The whole point of building an SSO infrastructure is that you have one login process and it works the same for every application", but sometimes there are good reasons to do the unreasonable. I'm not an ADF guy and I don't play one on the Internet, but apparently if you know ADF this makes complete sense.